The TRBC2 C-DOMAIN is shown in two different orientations. This figure shows the C-DOMAIN of a beta chain (PDB: 1bd2_E) of an alpha-beta T cell receptor. 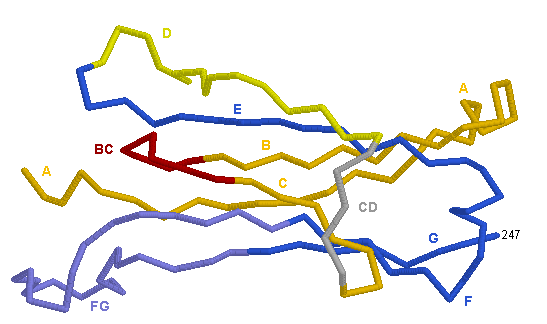 Only the C-BETA2, part of the TRB C-REGION, is displayed. The carbohydrates are not shown. In the PDB file, the sequence includes 17 amino acids of the CONNECTING-REGION of the beta chain, however, the 3D structure only includes C-BETA2 amino acids up to position 247 (according to the IMGT unique numbering for C-DOMAIN and C-LIKE-DOMAIN). The strands C, F and G are on the external face of C-BETA2. 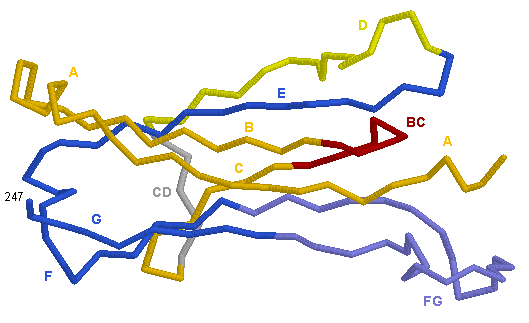 Strands A, B , D and E are on the interface with the C-ALPHA in the alpha-beta T cell receptor.